Below are eMachineShop’s default size and position tolerances and finishes that apply unless otherwise specified. Holes < 2″ +/- .005″. For parts with bends, the above applies to the flat sheet before bending. 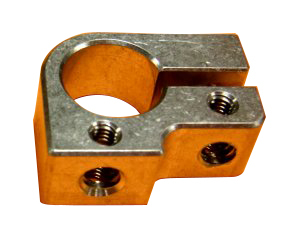 Upon request, tolerances down to +/- .001″ for metal and +/- .005 for plastic are available for features up to 3″. Metal: 0-12″ +/- .005″. 12-30″ +/- 0.01″. >30″ +/-.020”; Double values for plastic; Triple for Teflon. For injection molding, rapid prototyping and other non-machining processes, please see the respective web pages. 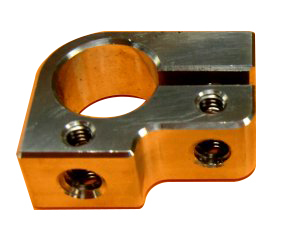 Machined parts are as-machined. Vibratory tumble is available upon request. This finish is as-machined. It is recommended, for safety, to include in your design chamfers on all edges to break sharp edges. Note that the above images are samples only – actual results may vary.